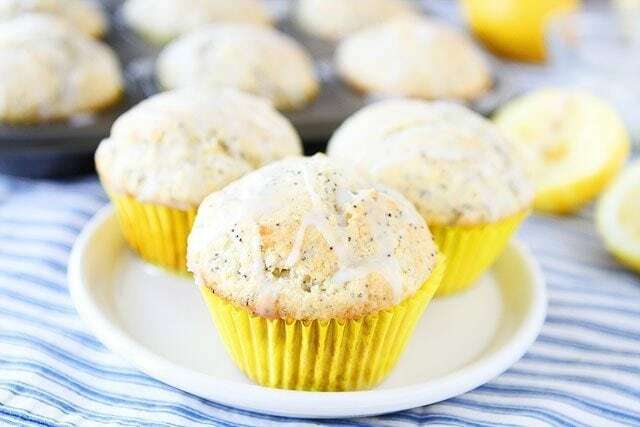 Lemon Poppy Seed Muffins with a Lemon Glaze – better than anything at the bakery, these homemade lemon poppy seed muffins are sure to brighten your day! My carb cravings are still going strong. Last week I made Whole Wheat Banana Muffins and they really hit the spot. I ate the entire dozen. Ok, maybe I shared with Caleb, but I tried to hide them so he wouldn’t ask for more. I know, I am a selfish mom, but the muffins were SO good! This week Josh asked me if he could make me breakfast. All I could think about were muffins. Josh asked if he could make our favorite Lemon Poppy Seed Muffins and I loved the idea. The recipe comes from my favorite cookbook, Baking: From My Home To Yours, by the fabulous Dorie Greenspan. We started making these muffins when were dating and we are still making them today. 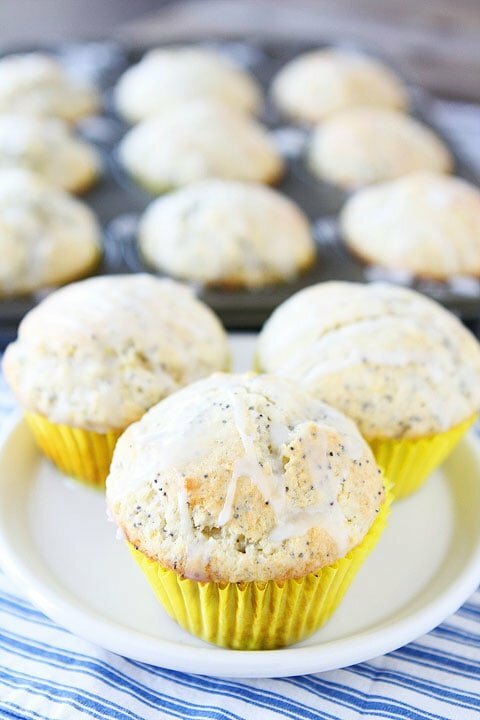 These lemon poppy seed muffins are perfection! We’ve probably made them a hundred times and every time I bite into one I fall in love all over again! There is fresh lemon juice and lemon zest in the muffin batter, which I think makes a big difference. The poppy seed muffins also get drizzled with a sweet lemon glaze, enhancing that lemon flavor. These muffins are lemonlicious! I also love the slight texture the poppy seeds add. You can find poppy seeds at almost every grocery store, look by the spices. Dorie uses sour cream in this muffin recipe, but Josh used Greek yogurt since our fridge is full of it. Both ingredients work well so use your favorite! 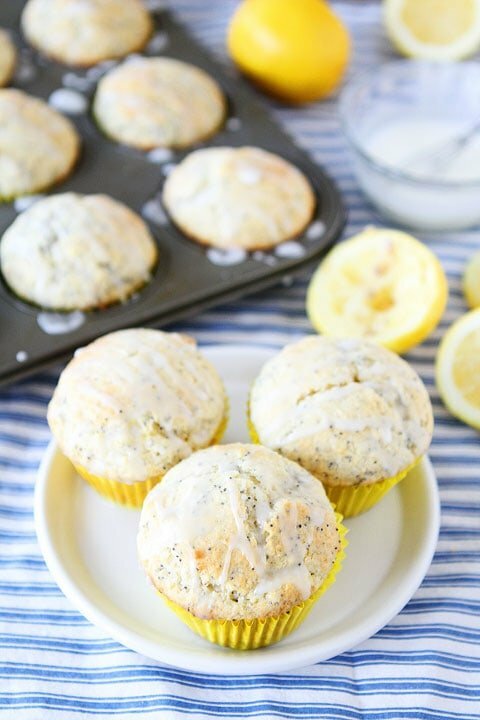 Lemon Poppy Seed Muffins are sure to brighten your day! They certainly made my day! I ate one for breakfast…and one for a mid-morning snack…and one for dessert later that night. They taste good any time of the day! Make a batch this weekend, you will not be disappointed! 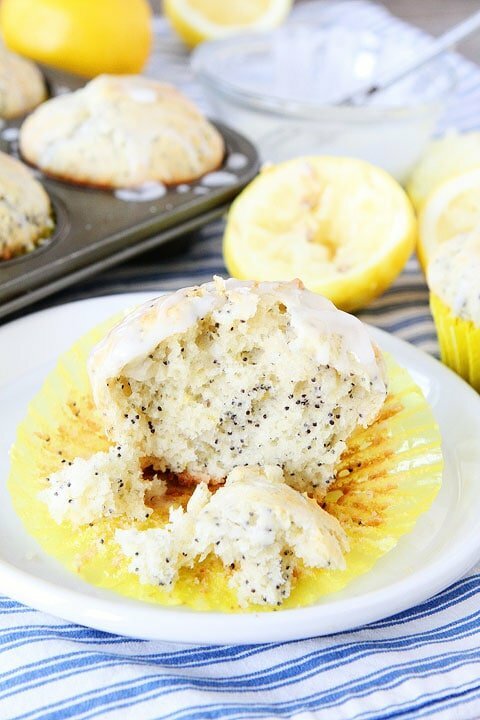 Lemon lovers will fall in love with these Lemon Poppy Seed Muffins! They are perfect for breakfast, brunch, or snack time! To Make the Muffins: Center a rack in the oven and preheat the oven to 400 degrees F. Butter or spray the 12 molds in a regular-size muffin pan or fit the molds with paper muffin cups. In a large bowl, rub the sugar and the lemon zest together with your fingertips until the sugar is moist and the fragrance of the lemon is strong. Whisk in the flour, baking powder, baking soda and salt. In a small bowl, whisk the sour cream or Greek yogurt, eggs, vanilla, lemon juice and melted butter together until well blended. Pour the liquid ingredients over the dry ingredients and gently stir to blend. Don't overmix. Stir in the poppy seeds. Divide the batter evenly among the muffin cups. Bake for 18 to 20 minutes, or until the tops are golden and a thin knife inserted into the center of the muffins comes out clean. Transfer the pan to a rack and cool for 5 minutes before carefully removing each muffin from its mold. Cool the muffins completely on the rack before icing them. To Make the Icing: Put the confectioners’ sugar in a small bowl and add about 1 1/2 tablespoons of the lemon juice. 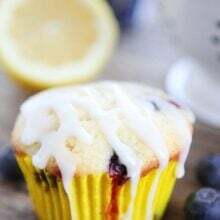 Stir with a spoon to moisten the sugar, then add enough additional lemon juice, a dribble at a time, to get an icing that is thin enough to drizzle from the tip of the spoon. Drizzle glaze over the muffins. Serve. Anything with fresh lemon is a winner in my book. These seriously are just what I need during these cold, cold days. I’ll bet that icing is incredible, too! Mmmm, these do look like perfection! I love that book too. 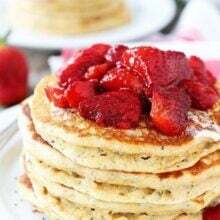 I might just have to whip up a batch this morning! These muffins look and sound amazing! I love poppy seed muffins – they look so delicate! Great recipe. Just looking at these gorgeous photos brightened my day! These will most definitely brighten my day! Perfect for a weekend breakfast! I ADORE that cookbook and actually just posted a different muffin recipe from it this week. Great minds 🙂 I’m definitely going to need to try the lemon poppyseed next. These look like a bite of sunshine in the dead of winter. fsajkhejrsdkjfh lemon poppyseed is my favorite ever. Seriously. Whoever invented that combination was an absolute genius. But these look super light and tasty! I’m going to argue that because they look light, I can have more..right? I freaking love lemon muffins!! Yum! I’m so into your muffin phase right now!! Lovely muffins!!! I make an orange poppyseed muffin that is yummy too! These muffins are a perfect way to brighten up a dreary, winter day! I could snack on these all day long! 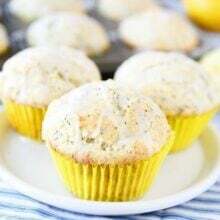 I just love lemon poppy seed muffins! I love love love lemon baked goods! And I don’t know what poppy seeds do to a muffin, but they just taste awesome! I can practically feel summer through these lemon poppyseed muffins. I hear ya. I’ve been craving carbs all day every day lately. I blame the cold weather, and take no responsibility for wanting all the muffins. I can’t stop looking at that close up picture of the muffin in the pan – BEAUTIFUL! oh! boy howdy, those look good. i’m normally not a lemon person, but lemon poppyseed muffins are (one of) my kryptonite(s)! Beautiful muffins! We had an abundance of lemons this year from our lemon tree so I definitely need to try these! 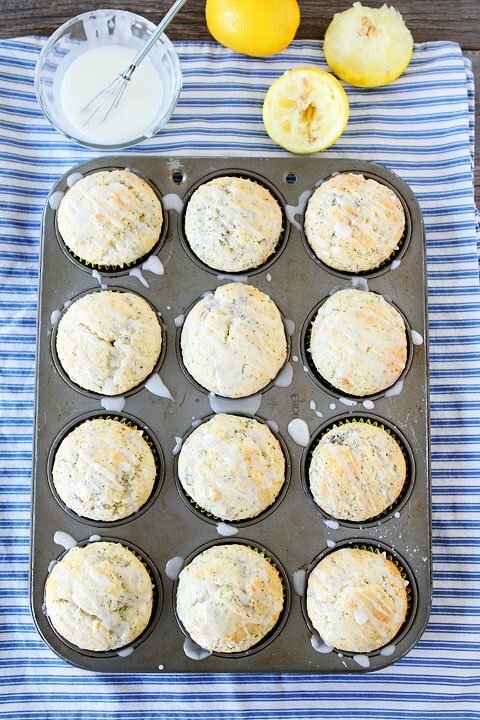 Gorgeous muffins, I love anything lemon poppy seed! These would be the perfect breakfast or snack. Love the fresh and bright flavors! I love all things lemon, and these look wonderful. I am pinning them right now to share with my readers! Yum!! I am making these now (even the batter is yummy!!). But here’s my question and please know that I am not an expert and maybe I missed this. But we mix the lemon juice/jest and sugar, and then following the recipe it mentions sour cream, vanilla, eggs etc and lemon juice again but in the directions I don’t see lemon juice as another ingredient until the icing. What am I missing or do I not understand?? I could eat these at every meal! Yum yum yum! 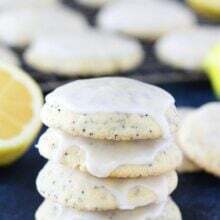 Lemon poppy seed are always my favorite! So pretty, bright & springlike! Great recipe! I could eat these for breakfast, lunch, and dinner too. You can see a photo of the results on my blog: http://darwinscreations.wordpress.com/ ! I made these last night, they turned out good but I am curious, the batter by itself was not that good, taste wise, with the icing these are over the top lemony which is great but I am wondering is the batter supposed to be “good” too? Stupid question I am sure, i used sour cream, my lemons had been on the counter for over a week so not sure if those were factors and I never did understand what “don’t overmix” looked like, is it possible i mixed them too much, will that affect the taste? I am not giving up though i will make these again and maybe try using the greek yogurt instead. On the whole though these were good….I mean who doesn’t read a recipe with fresh lemons as part of the ingredients and start to drool. Also the muffins themselves seemed to be overly dry. Any and all ideas/help are greatly appreciated. Hmmm, our muffins are never dry. They are quite moist due to the sour cream/yogurt. Sorry you had trouble! *I am not familiar with baking things that contain sour cream and i believe i was expecting something more “sweet”, realizing that i think that the taste of the muffins was extrordinary. *I think i may have used too much flour in the recipe but i also am new to making muffins….that being said i think they may have been spot on. Thanks for posting this recipe and your reply to my comments, appreciate ya. Pingback: Lemon Poppy Seed Muffins | Which~Craft 2 Create? I made these last night, and my husband & I loved them! Thanks for another great recipe! How do you get the tops of the muffins to be rounded like that? Mine come out sort of mushroom shape (wider at top than bottom of the muffin). looking at them in the pan, you can see the batter didn’t spill over onto the tin pan. I may be putting too much batter into the molds. i am reading your lovely recipe in Scotland, UK can you tell me how much is a “stick” of butter? A stick is one quarter pound, or 4 ounces, or 112 grams. When making muffins like the lemon poppyseed you say using all-purpose flour what would happen if I used sprouted wheat? Oooh, that must be the most delicious batter I ever made! I think it’s the yoghurt instead of the usual milk (I say usual, but I only made cupcakes once before, and they weren’t lemon and poppy seed ones). I can’t wait to taste the actual cupcakes. I found these to be a touch dry. I used a small lemon, next time I’ll either use a large lemon or two small lemons in the batter. I think I may also add a tablespoon of oil and hopefully they won’t be so dry. Fun recipe though! I was wondering if you are supposed to put the lemon icing on right after they are done cooling or right before you serve them?? Awesome recipe…..thank you sooo much for sharing. Made them this morning. Came out soft & moist on the inside with a nice light brown crust on the top. Perfect Easter treat. So glad you liked them! Happy Easter! I made two batches of these as they were so delicious. I posted about it on my blog and linked to your recipe if that’s ok? Even though I changed the glaze to a syrup. Thankyou for the delicious recipe! What’s a sick of butter? How much does it weigh? I have just baked them and they came out perfect!! I am always looking for recipes with poppy seeds! But I used limes instead. Lemon is quite expensive in Brazil and not so easy to find! They are delicious and beautiful!! I made these muffins and found them to be a little doughy and not easy to scoop or pour into my tins. I ended up having to add a splash of (whole) milk. Did anybody else have this problem? Did you have an alternative solution? Overall a great recipe, lemon poppy seed is always a winning combination! These turned out great! Thanks for the recipe! I made these muffins yesterday and they are incredible!!! The prep time took me longer than 10 minutes, but they were well with it. Maybe I’ll get faster with my lemon zesting and juicing next time. The muffins were very tender, moist, and lemony!!! The texture was very nice, but I didn’t care for the flavor. I like my muffins quite a bit sweeter and I could almost taste the baking powder. I also disliked the icing…maybe just too sour from the lemon for me. I think I’ll keep looking for a favorite lemon poppy seed muffin recipe. 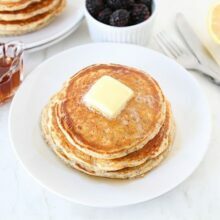 Do you think these would be OK with whole wheat flour? Just made these, and they were incredible! Thanks so much for the recipe! Once I got finished mixing everything together it seemed a little too thick, so I added about a tablespoon more of sour cream and a splash of milk and it was perfect. The glaze was awesome too. I added a little honey too it and it all turned out amazing. Thanks again! Tried these not much of a lemon flavor thought they tasted like a baking powder biscuit with lemon glaze. Oh, and I used a large lemon. I think a small lemon would not have produced enough of a lemon flavor for my taste. (The recipe doesn’t specify lemon size..) thanks again. These are actually amazing!! I’m new to baking healthier versions of muffins and i really loved them! They’re so easy to make also. A family member even asked me to bake her a whole batch after trying them. You have amazing recipes. Thank you !! Perfect – just made a batch for my co-workers (had to try one first). The taste is great and it was a quick and easy recipe with ingredients that you normally have on hand. Thanks – will definitely be making again. Do you think I could substitute coconut oil for all or part of the butter? Thanks! I accidentally added half of the lemon juice to the sugar, should I start over? Or make that part of the wet ingredients? I made this muffin for our New Hampshire Dietetic Association conference and it was a big hit! Everyone loved it and was asking for the recipe! I cannot wait to make this muffin again! I was wandering how many grams is in you 1 stuck of butter . In America I think it’s 113 but in the UK it is 250 . Which one is it ?????? I had a blond moment! I over looked the butter required by the recipe and left it out. By the time I realized, the muffins were already baked! Do you think it will make a huge difference or should I remake them? I’ve never made them without butter. Did you try them? Were they good? … love this website and all the recipes. Question about 400 degrees though. I just made this (using yogurt option) and I baked them at 400 for 18 minutes, they burnt. The whole outside is burnt. I never bake muffins at 400 and was hesitant from the start. Any body else experience this? Did I do something identifiably incorrect? Great recipe! I posted it to Facebook. Big problem though. There’s no easy way to print this recipe. When I printed it to my air printer from iPad, sheesh it printed out 24 color pages. Not happy with that. Perhaps you could add a print command to this page. If you click the print icon on the recipe a printer friendly version will pop up! Glad you liked the recipe! These are SO delicious! I love muffins of just about any kind, but not my husband. However, he did love these! Making them for the second time in a week. Thank you for sharing!! Just made a batch and they came out perfectly. I used low fat yogurt and a shot of Limoncello liqueur (I didn’t have enough lemon juice is the excuse I’m going with). I didn’t go with the glaze this time though. My carb conscience wasn’t ready for that. They look and taste great. Thanks so much for posting this recipe. Just made a dozen of these this afternoon. They are awesome. Substituted almond extract for the vanilla. The batter was way too dry as written. I checked and rechecked that I added everything listed and the batter was as dry as biscuit dough. I ended up adding about 1/2-3/4 cup of milk to get to the right consistency. Did anyone else have this problem? Made these today and while I like the simplicity of the recipe (and love the Greek yogurt factor), half my pan way over cooked rendering them dry and not very edible. I was skeptical about the 400 degree oven temp, but followed the recipe exactly anyway and baked for 17 minutes. Should’ve listened to my gut. Will try again as I like the recipe, but will cut the oven temp down to 350 or 375 to see if that helps. Just made this recipe and I found the directions were confusing. I did manage to finally get it all together, with a lot of whisking. Should taste okay, the batter tasted good. Best muffins I’ve ever made, not even exaggerating. Flavourful muffins. The outside came out crispy, while the inside was moist, chewy, and dense (probably due to the sour cream). I would use this recipe again when I have sour cream to use up, but make a few modifications. First, as some others have suggested, the baking temperature is too high, resulting in the crisp exterior and chewy interior. That’s not a bad thing, but can be if you prefer a consistent texture throughout. I would lower the temperature to 350° or 375° and extend the baking time. Second, echoing a few other comments, the batter as written is very dry. Someone said it reminded them of biscuit dough, and I agree (it reminded me of scones, though I guess that’s what Americans call biscuits?). Like the others, I had to add liquid to be able to mix the batter; even so, I had to knead it like dough. I used lemon juice to add flavour and thin out the batter, but milk would be good as well. Upon scooping the thick mixture into the muffin cups, I was not sure it would fill up and bake as normal muffins or come out like scones (hint: they did fill up, but came out small). All in all, a good recipe flavour-wise, but could use a few improvements texture-wise! Have made these a few times with 2 amendments; salted instead of unsalted butter and I like to add white chocolate chips. Apart from that I follow the recipe exactly how it’s written and they have turned out perfectly every time. Delicious! I did increase the lemon just a bit and decreased the poppy seeds (just personal preference) but the recipe is a keeper! Great recipe. Just because I want to use less sugar, I did half in the recipe. I also didn’t frost the muffins. My whole family loved them. I accidentally cooked a bit too long because my timer never started. We all loved the crunchy edge part of the muffin. I had frozen fresh lemon juice and only fresh limes. I used the lemon juice and the lime zest! I made these muffins today – they are very delicious. This is a great recipe! Can you let me know roughly how much juice you’re getting from your lemon? I have very generous Eureka lemons and can get wildly different amounts of juice from other people so I prefer to measure out the juice when possible! Thanks!